As a continuation to our countdown to the start of the season, the next player we are profiling is Benny Debrah, wide receiver and punt/kick returner. 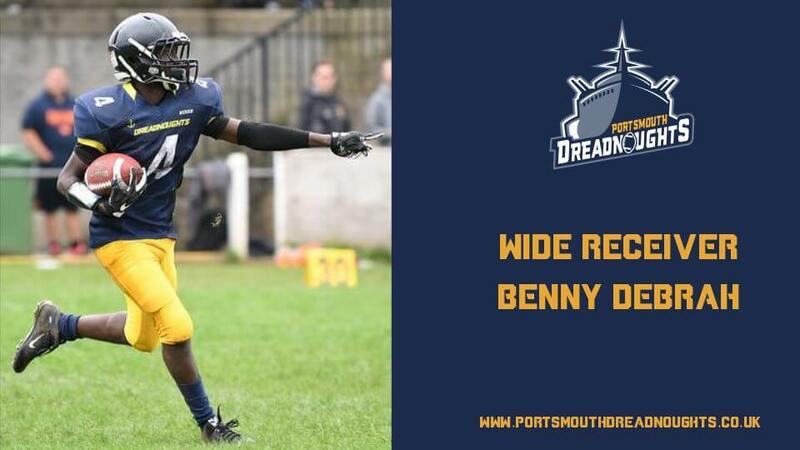 As well as a valued member of the Portsmouth Dreadnoughts, Benny is a stand out for the University of Portsmouth Destroyers. The Dreadnoughts are proud of our links to the local universities and Benny gives great insight in to playing both winter and summer ball. Please give me a brief overview of your ‘football life’ to date, how you got interested in football, positions you’ve played, teams you’ve played for and any particular highs and lows. I was on holiday with my American cousins, who brought their American Football to throw around and spent ages figuring out how they could make it spiral (still working on that). That’s when I first got the idea of giving it a shot! I started off with the Destroyers when I came to uni in 2017, after attending the taster session. I enjoyed running routes and already being put in a competitive environment with other guys new to the sport. I’d played a wide range of sports including rugby but admittedly i’m not the biggest of guys; so I knew that would work against me especially at this level compared to sixth form (where I could just about get away with not being huge). In terms of lows, one moment stands out. In my first season, home against Birmingham Lions (after losing the first game we all had a grudge). We were down in the 4th quarter, but we had a ton of momentum and were looking to come back, our defence were putting in a hell of a shift as per, forcing Birmingham to punt the ball to me, a punt returner…you can probably guess what happens next. I set up to block for my teammate who was also a returner, but I got a little too close to the ball, one of the Lions saw it and pushed me into the ball meaning they could recover it around 10yards from the end-zone and they took their chance. They went on to score the next play, convert the 2-pointer and win the game. This was a blow for me because it had never happened before and I felt like i’d let the team, coaches and spectators down but it was one of those situations you can either let kill your spirit or learn from. This is a huge part of learning you gain from playing the game i’ve found. Luckily there are some good bits, a high point would be a 40 yard kick return away (you’d never guess who against) at Xplosion, Birmingham’s main event. I consider this a highlight because in the previous game, I sprained a knee ligament on a kick return…on the first play of the game which put me out for a few weeks. Anyone that’s had an injury like that knows it’s as much mental game as a physical one, doubting how far you can push yourself in recovery. But no chance was I missing out on an opportunity to play in that setting, so I got taped up and was ready to go. You play both Uni ball for the Portsmouth Destroyers and ‘Adult’ ball for the Portsmouth Dreadnoughts, what are the differences between the two leagues in your opinion? Both leagues have strong aspects. I’ve found at the uni level, the pace of the game is quicker meaning fitness is especially key in order to keep up. In adult ball, the experience of the players I’ve played with (and against) is second to none, both leagues are key in developing as a football player. The links to the Universities are important to the Portsmouth Dreadnoughts, do you get a sense of that and would you encourage more students to play summer ball? Absolutely, just like the older players before me said to me, the experience is invaluable especially being new to the game (as I was just over a year ago). I’d more than encourage students to play summer ball! Even if you’re just looking to have a good time, it’s great fun and in particular recommend the Dreadnoughts (biased or not), I’ve felt included from day one, it’s one big family. As well as a wide receiver you are a punt and kick returner, could you please give our readers an insight into playing that role? Punt and Kick return are big parts of the game! They have the potential to change a team’s momentum. Kick return is my personal favourite; the opposing team would kick the ball to you after they score so you as a returner have the ability to swing the momentum in your teams’s favour. With both returns, it’s the thrill of getting the ball in hand, scanning the field for gaps, making a decision on what to do and possibly making something from nothing (a chance to make a big play). Your first game is against the Solent Thrashers. The Portsmouth Destroyers ended their season with a bitter game against the Solent Stags who will most likely have players that will play for the Thrashers. Is this a bit of a ‘revenge’ match for the uni lads? As a student you have many sports clubs on campus, why would you chose American Football over say rugby or Lacrosse etc? I enjoy the technical and strategic aspect of the game; you need the whole team (offense/defense/specials) to be on the same page or the plan won’t work. So unlike others sports (e.g. football) you can’t rely on one stand-out player to win you games. If you could please tell the readers a bit about yourself outside of football, background, what you are studying, other hobbies and interests and aspirations? I’m in my second year at uni studying Mechanical & Manufacturing Engineering. I’ve always been a keen on sports, always happy to give different sports a go. 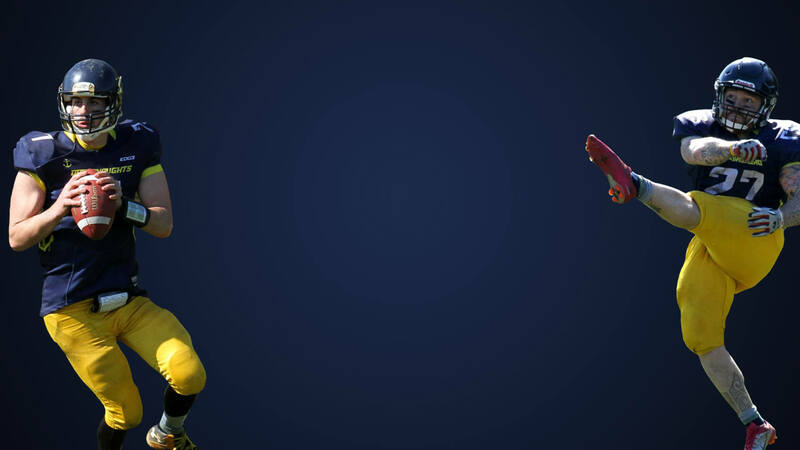 Favourite NFL player and why? Julio Jones, his size and ability are ridiculous. Name one thing you thought was cool when you were young that definitely isn’t cool now? If you were a professional fighter, what would your walk out music be? Stay with me and you’ll survive…I can steer a shopping trolley pretty well. If you could live in any other country, which one would you pick and why? Italy, I swear I could never have too much pizza. Thanks Benny, good luck this season! We caught up with the Portsmouth Destroyers Head Coach Cliff Boddington to ask him how he found coaching Benny this year. Don’t forget the Portsmouth Dreadnoughts kick off their 2019 campaign away to Solent Thrashers next Sunday 14th April at Test Park, Southampton. We would love you to come and support the Dreadnoughts!